The thing coming between you and a good night’s sleep might be the thin layer of bedding between you and your mattress. When it comes to improving your sleep, activity leading up to bedtime and the quality of a mattress are more frequently discussed factors, but as it turns out, bed sheets and pillow cases could be the reason you’re not refreshed when you wake up each morning. And, contrary to popular belief, a higher thread count, unto itself, might not be the solution. As TODAY dives into bed this week for the Snooze or Lose series, we pulled back the covers to get the truth about sheets. 1. Higher thread count doesn't always mean higher quality. Think sheets and pillow cases with 1,000- or 1,500-thread count are more luxurious than those with smaller numbers? Think again. Michael J. Breus, an Arizona-based sleep expert known as "The Sleep Doctor," says thread counts exceeding 500 are redefining the word "thread" because, at that point, "what you're looking at is probably two textiles that are woven together." Ariel Kaye, the founder and CEO of Parachute, a California-based bedding company, doesn't even mention thread count on her website. "Anything that’s over 400 is a manipulation of fabric or thread," she says. "The problem with higher thread counts is that they use these synthetic finishes; when they dissipate, the sheets are going to be unrecognizable." Both experts recommend thread counts that top out at about 400. 2. Some materials are cooler than others. Synthetics have a tendency to trap heat, making for a more uncomfortable sleep experience; quality cotton gets better reviews. According to the Parachute website, Kaye’s company uses “Egyptian cotton, combed with precision to remove all impurities.” Breus' preferences are also along those lines. 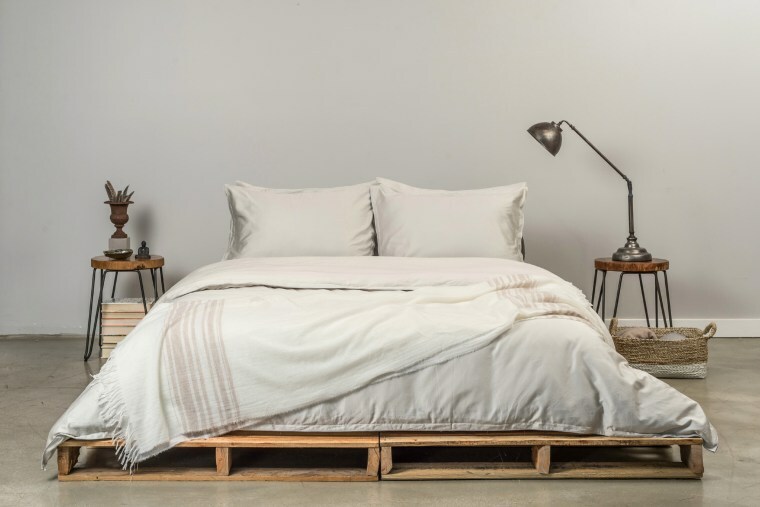 “The bottom line is that pima cotton or an Egyptian cotton are the best materials to use in a sheet," he said. "I, personally, like the sateen type of finish, just because it’s softer." For menopausal women who are prone to hot flashes and night-sweats, Breus often recommends moisture-wicking sheets, which offer next-level coolness. 3. Wash new sheets before you use them. 4. For sleepers with sensitive skin, detergent may be more of an issue than bedding material. “The bigger deal with sensitive skin has to do with what you wash it in, in terms of detergent, than the actual textile itself, in most cases," Breus said. "So, what you really are looking for is those [detergents] free from things like perfumes, dyes and things like that." That said, Kaye's company is certified by OEKO-TEX, which checks to make sure no toxic chemicals were used in a manufacturing process. “Fiber might have been grown organically," Kaye said, "but that doesn’t mean it wasn’t processed without toxic chemicals." 5. Toss bedding in the laundry basket every seven to 10 days. 6. Seasonal bedding might make a difference. 7. Buy new bedding every 18 to 24 months. Like most clothing (other than, say, jeans and sneakers), newer bedding just looks and feels better. "Like any fabric, hot water and repeated washing will shorten the life span," Kaye added. 8. Can't wait that long and want a less expensive solution? Just buy some new pillowcases. “It will completely change the way your bedding feels," Kaye said. "It’s just a really easy way to get that freshness, and make you feel like you have a whole new set of bedding." 9. Oh, and about that myth that silk pillowcases can reduce or prevent wrinkles? Breus is skeptical, and contends wrinkles are more of a matter involving skin dehydration. “Whether or not you have wrinkles," he said, "has nothing to do with the surface on which you sleep."